Flint school water fountains back in 2016. It’s been more than four years since the water crisis struck Flint, Michigan, and residents are still reeling, particularly parents worried about the impact of lead on young children’s development. In a seeming bit of good news, the Michigan Department of Environmental Quality announced Monday that the school district’s water is finally just as safe—or safer than—bottled water. Trust, however, is a problem for people living in Flint. No matter how safe the water is, some city residents won’t be so quick to believe the government again. After all, the city has fudged water samples in the past. The state knew the water wasn’t safe and let the city of nearly 100,000 use it anyway. And the Environmental Protection Agency, which regulates public water at the federal level, concluded earlier this month that the Flint water crisis was, in large part, its fault. Perhaps residents shouldn’t be so quick to trust, said Laura Sullivan, an engineering professor at Kettering University who sits on the Flint Water Inter-Agency Coordinating Committee. “Why in the world would anybody think that the agency that caused the problem could be trusted to actually fix it?” Sullivan told Earther. She said the state’s new methods of water testing are a cause for concern. The methods are different from how the state tested water earlier this year, which found elevated lead levels in more than 4 percent of water samples in the school district. The state didn’t take any action to find out where the lead was coming from either, Sullivan said. Her suspicion is that instead of solving the problem, the state figured out how to make the water appear fine. “I do not understand why it is that the state of Michigan would go in and test and find lead in the school water and not do anything to see where it’s coming from,” Sullivan went on. The Michigan Department of Environmental Quality said to Earther via email that it’s sampling the water coolers and bubblers because that’s where students are most likely to drink water. Previous tests were meant to evaluate worst-case scenarios. Back then, the state was testing faucets in the classroom. Now it’s testing water bubblers and coolers. By using these water bubblers and coolers as data points, the state is making the case against further testing or filtering the water pouring from the faucets. They’ve gone ahead and classified these faucets as not “intended points of use” for drinking water with the Michigan Department of License and Regulatory affairs, so it appears unlikely they’ll be monitoring these faucets any further, Sullivan said. These latest tests involve flushing the water through the system before collecting samples. Studies have linked this process to reduced lead levels in water because it allows any water that’s been sitting in the pipes to run, but this doesn’t always keep lead levels safe throughout the school day when water may sit in pipes for hours. The state sampled water in all 13 school buildings within the school district from June 6 to July 9 using these methods. All 420 samples registered at or below 15 parts per billion of lead, the federal action level. However, no amount of lead is safe for a child to drink, so the state was sure to note that more than 99 percent of the samples were at five parts per billion, the amount at which water companies are allowed to bottle water. These results are good, which is why Sullivan is skeptical of them as is Gina Luster, a local organizer with Flint Rising, a community organization that came out of the city’s water crisis. Sullivan agrees. She tried to tell the state last year that residents, families, teachers, and other school employees should be trained to conduct these tests and, ultimately, sit with experts to take a look at the data themselves. That way, they can have an educated voice and speak to how the city and state should remedy the problem. They should get to decide if they want to find the source of lead or not, Sullivan said. The state denied her proposal. The state has put out data showing the city’s water quality to be slowly improving, but the public remains skeptical. Flint could have the best water in the country, but no one will drink it if they don’t believe it. Correction: Wednesday, August 1, 2018, 12:33 p.m. ET: This post has been corrected to clarify that the state isn’t required to monitor school drinking water. 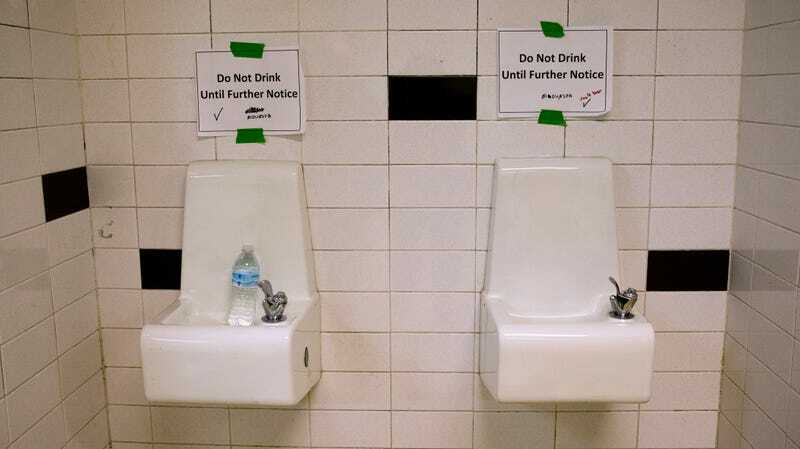 Instead, the state is unlikely to continue monitoring water from classroom faucets because it classified them as not being “intended points of use” for drinking water. Updated: This post has been updated to include a comment from the Michigan Department of Environmental Quality.